Last year, when I heard that the McEwans were retiring from the strawberry farming business, I was devastated. Where was I going to source my berries? Luckily, Allen and Tonette, after 20 years in business, weren’t going to leave their customer base out to dry. They had a succession plan – and were passing the torch to a new generation of strawberry growers. Here, we meet Carrie and Remi Charron, the proud proprietors of Camel’s Back Harvest, Pemberton’s new strawberry growers. So, what qualifications does a person need, to become a strawberry farmer? You, Carrie, grew up in Pemberton on a farm and worked summer’s for McEwan’s. Did you think that when you grew up, you would come back here, with your own family, and become a farmer? Growing up in Pemberton and working for McEwans were really great; a small community like Pemberton offers so much for a child to learn and experience, just because of its small size. At times during my youth I thought of being a farmer, but by the time I finished high school I was thinking about creating things that weren`t necessarily on the farm, and that`s why I decided to move across the country to Montreal to go to McGill. But growing up on the farm, I had unwittingly developed a passion for growing and eating my own food. At first, that passion was satisfied by buying my produce at farmer’s markets and through a local farm. It was only when my husband and I started talking about how it would be both a great learning experience for the kids to grow up on a farm, and that it would help make our family more resilient, that we really started to consider moving back home to the farm. However, once the seed was planted, it didn’t take long for it to grow; Remi quit his job and we moved across the country. Serendipity. 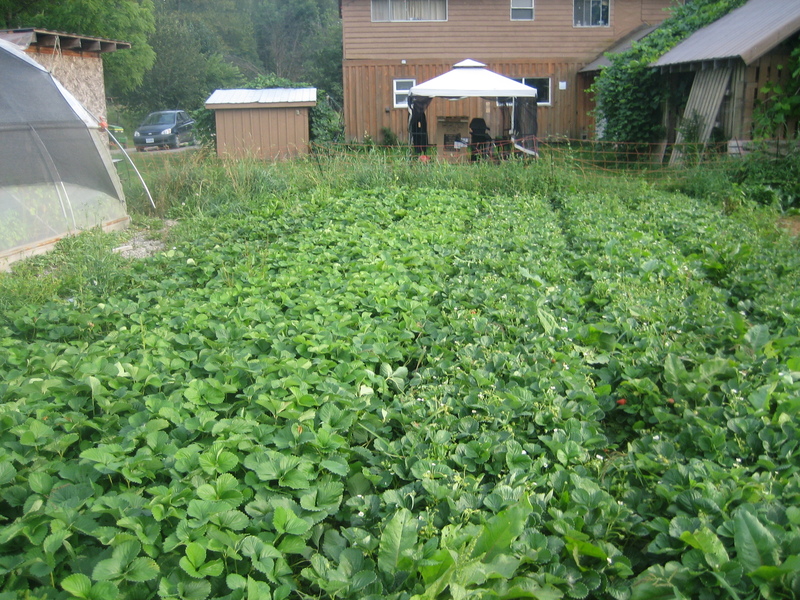 We moved back to Pemberton with no concrete farming plans. After considering countless options, we decided to start a market garden. We wanted to buy some strawberry plants, so that we could sell strawberries at the Farmer’s Markets. Carrie chatted with the McEwans about strawberry suppliers at the Pemberton Farmers Institute AGM last year. Shortly afterwards, the McEwans decided that they were ready to retire from the strawberry business, and so within weeks of chatting with them about strawberries for our market garden, they called us to ask if we wanted to buy their plants for the 2012 season. We both thought it was a great opportunity that we could not pass up, so we jumped at it. What’s the most important thing/ingredient to growing great strawberries? Work. There are many factors to growing a great strawberry, including having healthy nutrient rich soil, choosing the right variety of berries, and making sure they have enough water. But the most important ingredient is work. 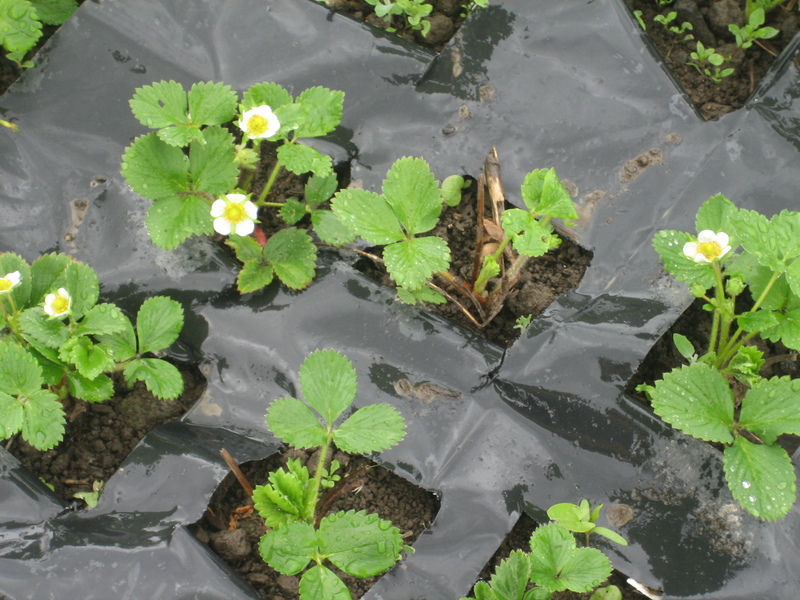 There are over ten thousand strawberry plants that need tending to. It is important to take out all the weeds so that the plants thrive, which means being on your hands and knees pulling weeds whether the sun heated the sandy soil so that it is burning hot, or that it’s cold and raining, or if mosquitoes are out for a feast. Camel’s Back Harvest is situated at the base of Camel’s Back Mountain, approximately 25 minutes north of Pemberton. We are 20 km past McEwans’ Farm, on Pemberton Meadows Road, right before the pavement ends. It is a very scenic drive up the valley, the same route followed by the Slow Food Cycle, and likely part of the bike route used by the Whistler Ironman. You will find Camel’s Back Harvest at Kuurne Farms, which grow potatoes, as well as Pemberton Meadows Natural Beef. And how did Camel’s Back Harvest come by its name? It took a few weeks of brainstorming different names before we arrived at Camel’s Back Harvest. The name comes from the farm’s location, which is at the base of Camel’s Back Mountain. We didn’t want to have a name specific to strawberries, since we grow other produce as well, with our other main crop for this year being squash. Tell us a bit about yourself. You and Remi moved from Ottawa to Pemberton last fall. How long had you been away? I went away to university after high school and returned 13 years later with my family by choice in September 2011. I received a B.Eng in chemical engineering at McGill, in 2003, and worked for a local non-for-profit environmental group in Montreal, before I decided to become a stay-at-home mom. Remi grew up in Sudbury, ON, with no exposure to farm life. He is a mechanical engineer with a Master’s and Ph.D. in Building Engineering. He has been interested in farming since meeting Carrie and visiting her family’s farm in Pemberton. Last year he was working full time on the farm, helping to get things started. This year, he has his own consulting business and will be working on the farm as much as he can between work and helping take care of the kids. We met when we took the same environmental course together at McGill, and Remi asked me to do a term project with him. I agreed, and we started dating at the end of the course and have been together ever since. What were you doing in Ottawa? Carrie was a stay at home mom, following Attachment Parenting principles while also taking care of a large family garden, and offering breastfeeding support through the local health authority. Remi was working as a Senior Researcher in Sustainable Housing at Canada Mortgage and Housing Corporation (CMHC). What made you move back? Our society is going full steam ahead following a fundamentally unsustainable economic system that has a general disregard for the environment. If something is unsustainable, it cannot be sustained indefinitely. We believe that within our lifetime our society will have to pay the price for not heeding to obvious warnings and will suffer economic and/or environmental collapses. Given that belief, we debated and thought about what would be best to help improve our family’s resilience and help prepare our children for an uncertain future. Given that we believe that strong local communities with thriving local economies will be more resilient, and that farming and growing your own food is a skill that will always be in demand, we decided to move back to the family farm in Pemberton. What has been the best thing about being back in the Valley? The best thing about being back in Pemberton has to be that we are living in the scenic mountains and the sense of belonging that comes from returning to your hometown. We moved in with my parents in my childhood home. After years of living on our own, it has been a challenge to adjust to living as a larger family unit. We are still making adjustments and trying to find a happy medium where everyone can live together and love one another, and still have the personal space we require. It is the responsibility of being the go-to U-Pick strawberry farm. As you say, if we have a failed crop, or if we can’t keep the bears from eating all the berries, it isn’t just us that will be disappointed. We also feel a responsibility to keep offering u-pick strawberries into the future, regardless of what happens. How old are you and Remi? Carrie is 32 and Remi 33 (34 in April). It strikes me as super exciting that you and your brother are both farming in Pemberton – how big a deal is that for your parents? Is there a lot of overlap between what you all do? Are Sunday suppers dominated by talk about farming etc? I don’t think my parents ever expected that I would come back to the farm. So, it has been quite an adjustment for them to go from having a nice big quiet house, to having pre-schoolers running around making lots of noise with toys strewn everywhere. I think that they are excited to see the potential of having the family farm move on through the generations; I think we all are. There is definitely overlap in what we do, as we both try to help each other out when we can. Over the years, I would like to become more involved in the potato business, but for now we need something that will bring in some income to support another family. Living and working together as a large family unit is proving to be interesting; we go through times that are great and we’re all excited about our future and what we’re doing, and then we have times when we’re in disagreement about what our path should be; the lifestyle of living and working together as three generations! And what does that say about what’s happening in agriculture? Pemberton seems to be quite unique in the number of farmers under 40 here… as compared to the rest of North America. I think the trend of having younger farmers is happening everywhere in Canada. It seems that Canadians are starting to put more value to locally grown food, which is encouraging younger people to start farming. I think we have a long way to go to help bring down the average age of farmers, but it is encouraging. For now, it is extremely challenging for young Canadians to start farming and make a living at it. They need to be passionate about it to put in the countless hours for the less than spectacular financial rewards. A couple would have a better chance of making money working for minimum wage than getting into farming. How many years of prep has gone in to getting Camel’s Back Harvest ready for operation? 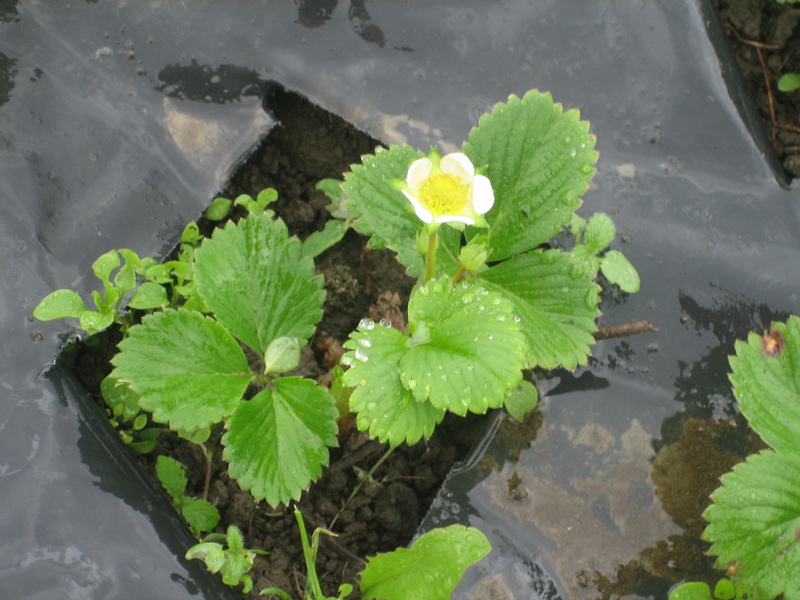 In a commercial operation, you typically don’t harvest the strawberries in the first year. So last year, we planted just over 2 acres of strawberries to be ready for this year. Will you be ready for operation this summer? Yes, providing our strawberry plants made it through the winter after the severe pruning the deer gave them late last fall. What kind of operation will you be running? We will be starting with a similar operation to what McEwans had, with a mix of u-pick and ready pick. We will evaluate after this summer to determine where we may make any adjustments. How many acres of strawberries? Are you just starting with 2? or do you plan to keep planting more? We currently have approximately 2 acres of strawberries. We will plant another acre this year, and the following year we will add another acre and a half, so that we will have a rotation with 4.5 acres in total, with 3 acres being harvested each year. Anything else? All U-Pick? Will you do any markets or supply direct to anyone? We are planning on being primarily a u-pick strawberry farm, but we are considering bringing some strawberries to the Pemberton Farmer’s Market, and we will take orders for ready pick. There are a number of local restaurants, caterers and other businesses that are interested in larger orders, which we are looking into the feasibility of supplying. Where can people find out more about you or get the updates when the strawberries are ready?